You may have heard of Nederburg. They're only the most famous and most awarded South African winery on the planet. It got its name in 1791 from German immigrant Philippus Wolvaart, who named his wine farm after Commissioner-General Sebastian Nederburg. I just call the winery Nedes. We're buds. Alright, they have no idea who I am. But I like to pretend. 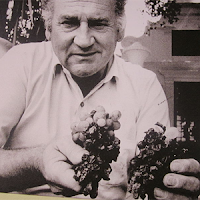 This particular wine of theirs gives homage to their former cellarmaster from 1956 to 1989; Günter Brözel. This guy built Nederburg's reputation, and his favorite form of transportation was via motorcycle. He also was the first to make noble late harvest wine in South Africa, which he called Edelkeur. 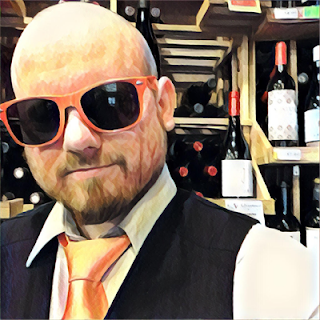 Current cellarmaster Razvan Macici, an award-winning cellarmaster himself, draws inspiration and drive from Brözel's legacy. Wilhem Pienaar is the current winemaker. 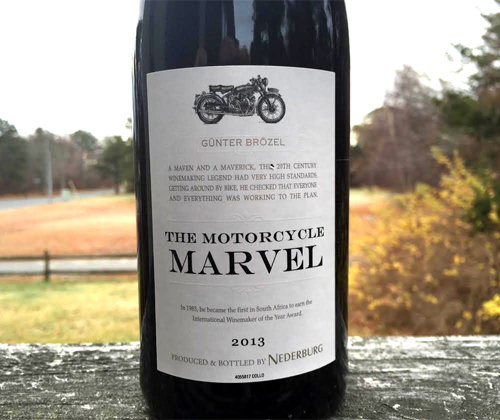 The Motorcycle Marvel is a Rhone-style red blend containing 35% Carignan, 30% Grenache, 25% Shiraz and the remaining 10% is Mourvédre and Cinsault. The Grenache and Carignan come from the Paarl region, the Shiraz from Philadelphia (not the American city where they boo Santa Claus), Mourvédre from Darling and Cinsault from Stellenbosch. The wine saw 24 months in French and Romanian oak. The package is simply awesome. The wine is contained in a Rhone-style bottle. The white label has a motorcycle on top (somebody told me it actually looks like a military motorcycle) with Brözel's name under it. Then it reads "A MAVEN AND A MAVERICK, THE 20TH CENTURY WINEMAKING LEGEND HAD VERY HIGH STANDARDS. GETTING AROUND BY BIKE, HE CHECKED THAT EVERYONE AND EVERYTHING WAS WORKING TO THE PLAN." Then, under the title of the wine, it reads "In 1985, he became the first in South Africa to earn the International Winemaker of the Year Award." This sucka is a deeply pigmented ruby red. Just by looking at it I know that this is what I need right now. Not to mention it's got a 14% ABV. I can probably take this thermal off because things are about to get nice and cozy. On the nose there's the aromas of grape jelly, prunes, black olives, maple, sweat, fine black table pepper, ethanol and dusty minerality. It's an oddly fascinating and alluring complex nose that's bold, sweet, spicy and earthy. If I ever faint then use this to wake me up instead of smelling salt. The first thing I think of when the wine hits my mouth is the flavor of dates but it's not sugary at all. Then on the midpalate it goes to cran-grape juice, stewed plums, and maple and cherry wood. It's very lush and smooth on the midpalate... but the longer you keep it in your mouth and swish it around, heat builds up until your tongue screams for mercy. It finishes very dry with the tannin stripping away your saliva, and you're left with the flavors of espresso and toast. Uh, yeah. There's A LOT going on there. But is it good? Is it worth the $28? Hell yes. And because it's so robust, flavorful and has those sweet fruit flavors while still being dry and tannic, it'll go perfect with the winter weather and holiday dinners. I recommend that if almost $30 is within your wine budget that you should give this Günter a gander. Whether it be driving a police bicycle, a completely dressed visiting machine or a raked chopper with a springer front end, the Harley Davidson cruiser motor is a mechanical wonder that is very one of a kind. Exhibited here is an article which offers a few reasons why the Harley Davidson cruiser motor is so remarkable. What a great post you have shared here on The Motorcycle Marvel! I really feel better to read it. Here sucka is really nice. Thanks. Nederburg is very popular in South Africa. I thing The Motorbike Marvel is more than tasty from it. Thank you for introducing a new product to us. Motorcycle accessories can enhance your riding experience. What things should you consider when selecting motorcycle accessories? You can ride safer by following these quick tips on motorcycle safety. Always assume that you and your motorcycle are totally invisible to other drivers.